A few weeks ago, my friend Ann messaged me on Facebook and shared her favorite way of cooking eggplant which she learned from her friend. I am interested in the simplicity of the preparation and curious by her review of the dish. According to her, it is the only way of cooking eggplant that she’s going to eat. So I’m thinking it must be good that one gal who has an eggplant aversion changed her mind and can now eat it without a lot of convincing. So I promised to try out the recipe and if I liked it, I’ll post it on this blog. 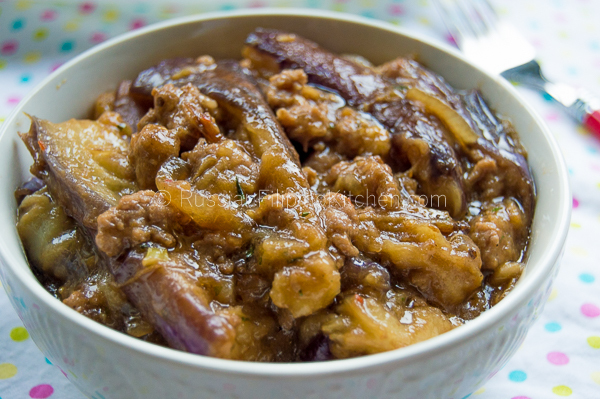 This eggplant with ground pork recipe is close to the ingredients and method of preparation that my friend shared with me. Since she didn’t give me the exact measurements and precise procedure, I used my own preference and cooking techniques. The original recipe is spicier with the addition of extra hot peppers, but I prefer to omit it since I am not a huge fan of spicy dishes. So here’s the recipe. Ann is right, it is delicious and satisfying 🙂 . 1. 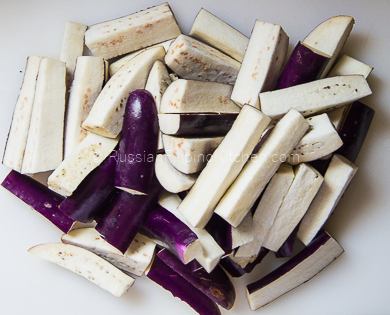 Wash eggplants with cold water and pat dry with a paper towel. Cut top ends with a knife then cut into 2 ½ – 3 inches lengths. Cut each portion in half lengthwise then into quarters. Do this for thicker eggplants. If you have the skinnier variety, just cut each portion in half. 2. Peel and slice the onion. Peel garlic cloves and mince. 3. Heat up a frying pan with oil over medium high. 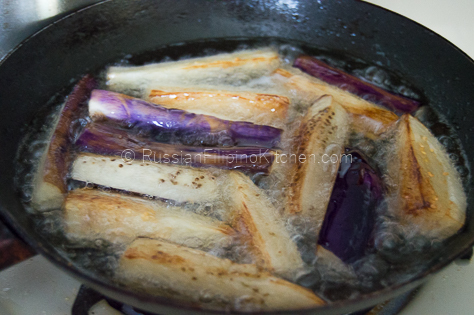 When the oil gets very hot, fry the eggplants in batches until just cooked and browned, about 3-4 minutes. 4. Drain on plate with paper towels and set aside. 5. Heat up sauté pan or skillet over medium high heat. Add 1 tablespoon of oil from the frying pan you used earlier. (Note: Do this when you’re using extra lean ground pork. 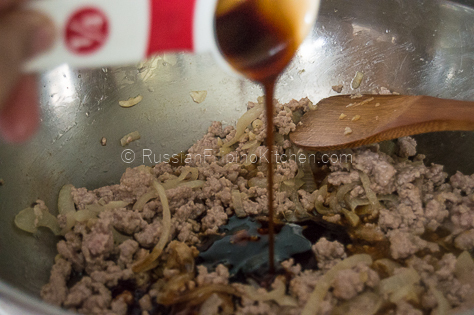 However, if you have regular ground pork with fat, no need to add extra oil. 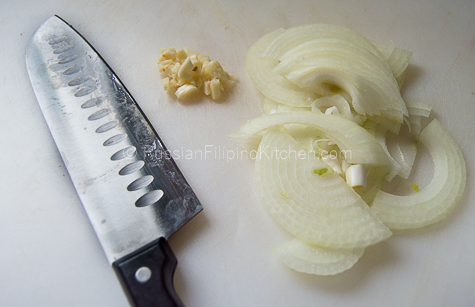 Just render the fat from the meat and proceed with sautéing garlic and onions). Saute onions and garlic until onions get translucent and garlic has browned a little. 6. 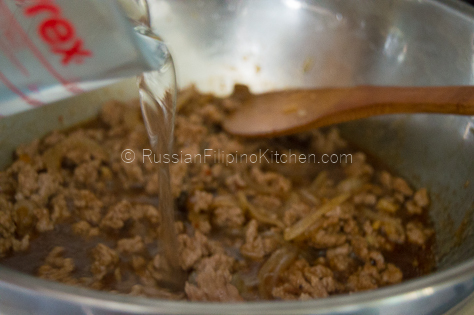 Add ground pork and sauté until no longer pink. Use back of spoon to break clumps of meat. 7. Season with oyster sauce, soy sauce, sweet chili sauce, salt, and pepper. Stir. 8. Add water and Thai chilis. Bring to a boil then lower heat. Simmer for 15 minutes until the meat is thoroughly cooked and sauce has reduced a little. 9. Add fried eggplant pieces into the sauce and mix together. Simmer for 30 minutes until sauce has further reduced, stirring every 10 minutes or so. 10. Remove from heat and allow to cool before serving. Best served with boiled white rice. 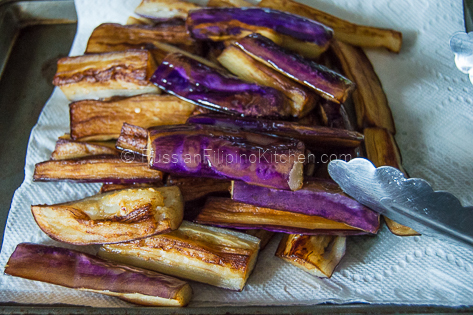 Wash eggplants with cold water and pat dry with a paper towel. Cut top ends with a knife then cut into 2 ½ - 3 inches lengths. Cut each portion in half lengthwise then into quarters. Do this for thicker eggplants. If you have the skinnier variety, just cut each portion in half. Peel and slice the onion. Peel garlic cloves and mince. Heat up a frying pan with oil over medium high. 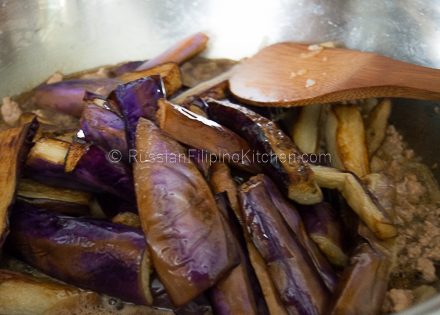 When the oil gets very hot, fry the eggplants in batches until just cooked and browned, about 3-4 minutes. Drain on plate with paper towels and set aside. Heat up sauté pan or skillet over medium high heat. Add 1 tablespoon of oil from the frying pan you used earlier. (Note: Do this when you’re using extra lean ground pork. 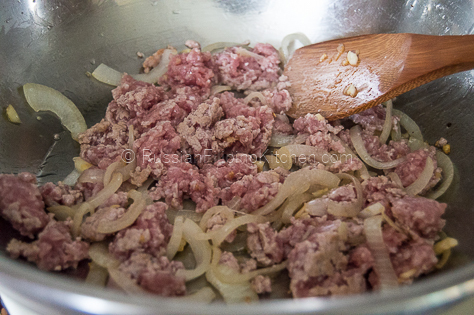 However, if you have regular ground pork with fat, no need to add extra oil. Just render the fat from the meat and proceed with sautéing garlic and onions). 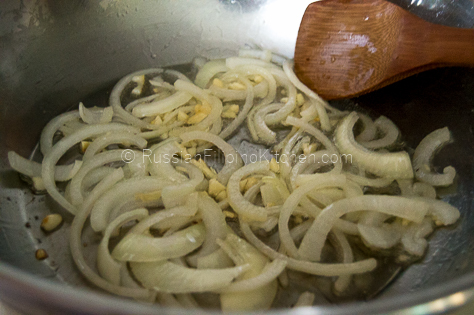 Saute onions and garlic until onions get translucent and garlic has browned a little. Add ground pork and sauté until no longer pink. Use back of spoon to break clumps of meat. Season with oyster sauce, soy sauce, sweet chili sauce, salt, and pepper. Stir. Add water and Thai chilis. Bring to a boil then lower heat. Simmer for 15 minutes until the meat is thoroughly cooked and sauce has reduced a little. 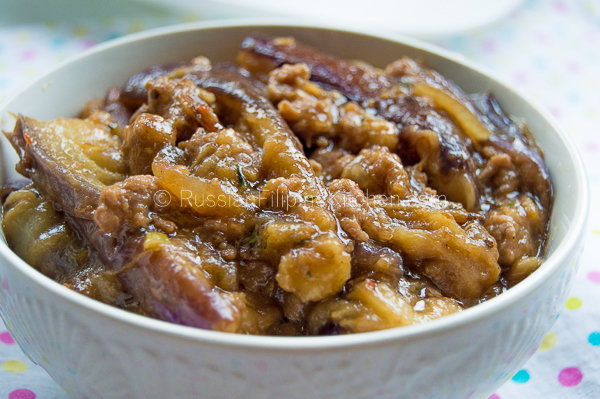 Add fried eggplant pieces into the sauce and mix together. Simmer for 30 minutes until sauce has further reduced, stirring every 10 minutes or so. Remove from heat and allow to cool before serving. Best served with boiled white rice.